The Chevrolet IndyCar aero kit for the DW12 is, uh, angular. Lots and lots of angles and flaps—so much so that it reminds us of the Formula One racers from almost a decade ago. Moreover, we're still not really sure why this is the big issue the series chose to tackle for 2015. This aero kit is designed for road course and short oval use, although a configuration for high-speed ovals will be unveiled before the Indianapolis 500 in May. Maybe the wider IndyCars have different aerodynamic needs than other, more open-wheel designs, but it all looks a little primitive with so many add-ons and flaps. GM stands by their design as a triumph of function over form, which sounds about right. "This new aero kit provides Chevrolet drivers the capability to enter and exit corners faster, while maintaining high speeds on the straights," said Chevrolet IndyCar program manager Chris Berube in their press release today. Chevrolet releases aero kit rendering. Those are all fine and wonderful things, and probably make an already rowdy race car even better to drive. Cool. What's distressing, though, is that this was the big news to come out of IndyCar's media day: an awkward looking body kit. Not any real solutions for putting butts in seats, or getting people to pay attention to the series at all. You know, the series. It's that thing that happens in addition to the Indy 500. They use these cars at other places, too, in case we all forgot. Here's the problem: every time IndyCar anything comes up in the news, I have to ask, "do we care?" So few people seem to follow it anymore that it's a bit sad. IndyCar is the uniquely American open-wheel[-ish] series. It should be a bigger deal. There should be news about where the series is going to be excited over, dang it. Not just a bodykit full of flaps and angles. I don't mean to poo-poo Indy's attempt to make the cars better to drive. However, I'm not the only one who came away from the round-up of IndyCar Media Day news with a big ol' "meh?" 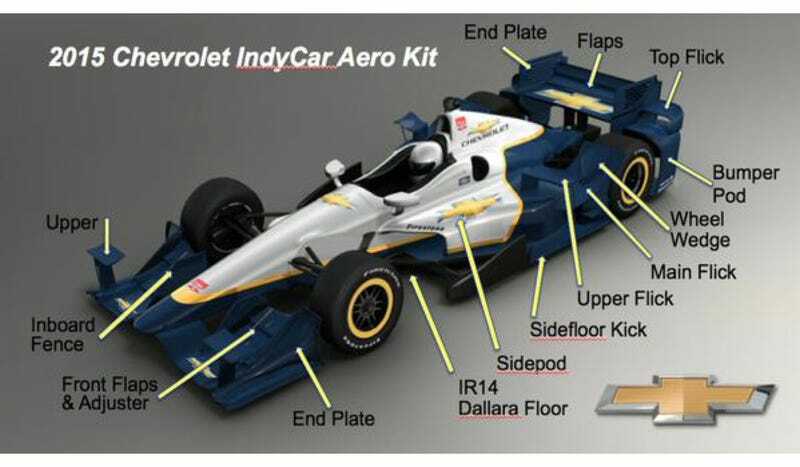 Buried among the mehs and fehs about the Chevy bodykit was some Media Day news that might work: IndyCar wants to add four more races by 2017, and they're not giving up on international venues. This! This is a thing that might work. Fans have been clamoring to see IndyCar tackle their favorite tracks for years, and the shorter schedule they have now is begging for more races. When Brazil fell through earlier this year, fans blurted out all kinds of venues that would be a riot to watch IndyCar tackle: Circuit of the Americas, Road America, Laguna Seca, Watkins Glen, etc., etc. There's a wealth of interesting and historic tracks that IndyCar doesn't get to, and that's just looking at America. The problem IndyCar is facing clearly isn't talent, as more and more decent drivers who can't find a ride in Formula One and other series look to IndyCar as a decent alternative. As I mentioned with Formula E, in F1's era of funding über alles, the guys getting nudged out in favor of pay drivers are still great fun to watch. The problem is getting people to watch. Outside of the Indy 500 and the St. Petersburg series opener that's been in the news, I had trouble even remembering where IndyCar was going to run this year. I knew of NOLA Motorsports Park because it's close, though. NOLA is great for that reason: when you put races near people in venues they want to see, then maybe, maybe people outside of Indianapolis will start to care more about IndyCar. The fact that IndyCar's sixteen-race schedule only runs from late March through August is a problem, and it's promising to see that they've at least acknowledged that there should be more racing outside of their established venues. Less promising was the hum-hawing about the potential venues to pursue from IndyCar boss Mark Miles. I'll cut them some slack: maybe they don't have enough nailed down yet to speak as to which other sites they're considering. Still, the excuses on the short schedule are a bit much. "We could fill in the early part of the series, in February, with additional North American races," said Miles, as quoted in Autoweek. "But, one, there aren't too many places where we can race, climate-wise. Two, we're determined to find really vibrant new race opportunities." Climate-wise, all the series starting up in January and February and running through the end of the year prove that this isn't really an excuse. January is a great time to run in Texas or California, for one. Some shuffling around of dates may be required to avoid the threat of ice and snow, but it can be done, especially if international venues could fill in the void. Miles told Autoweek that he was hoping to schedule a season ender on Labor Day weekend in an urban market with a decent following that could become the signature final race of the season. The length of the season is definitely an issue IndyCar needs to look into. With that long of an offseason compared to every other major racing series, maybe it's worth spreading out those sixteen-plus races in order to keep IndyCar in front of fans' eyeballs for longer instead of being forgotten while everyone's paying attention to United SportsCar, NASCAR and other major series from around the world. To be clear, I don't like it happening. One of the big takeaways for me, it's complicated, but it was an endorsement of IndyCar racing in a strange way in Brazil insofar as the sponsorships were at or above where they wanted them to be with a title and a major presenter. All the hospitality was sold. You couldn't buy another box or suite. Ticket sales were very strong. It was going to be at least 30,000, in terms of attendance, and it might have been 45,000 or 50,000, and economically it was going to be a success. So the politics is unfortunate. I wouldn't be surprised if they're not having second thoughts about all that right now. Several popular Brazilian drivers are in IndyCar right now, so I'm sure that helped quite a bit. Still, it was going to be a new venue for the series in a place where race fans wanted to see IndyCar go. It was on the right path. That's the path I wanted to hear more about today: how does IndyCar plan to promote itself to new audiences? Capture fans' interest again? Expand and grow instead of wither and die? Aero kits can only do so much. Getting people to pay attention to the cars running aero kits is the real issue that IndyCar needs to solve.